If you’ve got a puppy in your home, then you’re probably going through the phase right now where you want to make sure that your puppy has the best of the best so that he/she can look and feel as good as possible. With puppy shampoo brands, they’re all different and offer different protections. Today, I'll be reviewing 5 best puppy shampoo you can get in 2017! Flea Protection - If your puppy has ever suffered from fleas before, or you live in an area where you think fleas are rampant, then you should probably look for a specific type of shampoo that offers flea protection. The best puppy shampoo brands are always the ones that offer this as one of the main benefits because dogs have it worse than us humans when it comes to flea issues. Scented Shampoos – The smell of your dog when he/she needs a bath has to be horrible, so one of the best things you should pay attention to is the smell of the shampoo that you’re buying. Usually, the smell begins to fade after a few days, but if you’re able to pick up a shampoo for your puppy that will leave your dog smelling good for a while, then you should do it. Try your best to stay away from unscented shampoos, unless you like your dog smelling bad. Moisturizer – Some shampoos advertise that they can moisturize the skin of your dog. This is a huge benefit because a lot of dogs have issues with having flaky skin which can be annoying to them. Plant Cleansing – Some of the best puppy shampoo brands have plant cleansing shampoo that they sell. This usually means that they’re not going to stuff their shampoo full of regular soap and advertise it as dog shampoo, but they pay attention to the best ingredients they can put into their product so that your dog can have a nice bath. Tearless Ingredients – One of the worst things for a dog is getting shampoo in their eyes. That can be a painful, scary experience for them because a lot of the time they don’t even understand what’s going on when they’re forced to get a bath. With tearless ingredients put into the shampoo, you don’t have to worry as much about it getting in their eyes because it shouldn’t hurt them as much and will stop tears from forming to get rid of the shampoo. The puppy shampoo has nothing but natural ingredients, so you don’t have to worry about putting weird chemicals in your puppy’s coat if you’re someone who’s scared about that issue. This puppy shampoo is also good to use for dogs who suffer from skin issues. The fact that this is an all-natural oatmeal shampoo is one of the best things about it, which can help out a ton if your dog needs to find a fix for their skin disease. This puppy shampoo product is an all-natural, soap free product which is great at making your dog smell good after use. It doesn’t matter how dirty your dog is, this shampoo can take care of it. It’s also a fairly cheap shampoo for your dog, coming in at around $10, which just about anyone can afford. This shampoo isn’t just for dogs, you can use it on any pet you have, hence the name of the product! People have had a lot of success with using this product on their cats as well! So if you have a puppy and need some more shampoo, then you can use this on both your puppy and your cat, as a perfect dual animal shampoo product! This shampoo is one of the best puppy shampoo products for dogs with skin allergies as well. A lot of dogs have itchy skin constantly and need to figure out a way to get rid of that symptom. With this in mind, you should buy a product like this which can be perfect for your dog. Once again, with this product you can expect every ingredient to be natural, so your puppy won’t have to deal with unnatural chemicals. Isle of Dogs has been able to create one of the best tearless dog shampoos for your pups. One of the best parts about this specific shampoo is the fact that it’s one of the cheapest kinds of shampoo you can get. If you have a large dog, you can even buy the gallon version so that you won’t run out quick! Here are some other features for you to think about! The product is sulfate and paraben free, which is something for you to consider if your dog has issues with those two compounds. It’s another good-smelling product that you can put on your dog. Although it’s not the best, you can certainly justify for this product based on the price point that it’s being offered at! You can pair this up with some dog conditioner, which might help out with the overall feeling of the fur after the bath. This shampoo isn’t a conditioner, but it does make it smell good and feel a little bitter. However you can always find a little bit extra with a conditioner added into the mix. Overall, this is the best puppy shampoo on a budget. If you don’t want to spend a lot of money, then this is the shampoo for you to use. Wahl is a great company for you to buy from when you’re looking for the best puppy shampoo products. Every product they make for your dog is going to be of the highest quality and is going to be made from natural ingredients. One of the best things about this product is that they have so many options! You can choose shampoos meant for dogs, and you can choose shampoos made specifically for a young puppy. It’s up to you to choose what you want! Since everything is completely natural, you can also expect it to be tear free, which means that your dog won’t be crying from the pain caused by shampoo getting in his/her eye. They make a specific product for fleas and ticks, which means that you can help your dog out with some perfect medicated shampoo if he/she suffers from some fleas or ticks. The company makes a very specific shampoo for dogs with odor issues. A lot of dogs have odor issues, and they make a shampoo that you can choose from which will allow you to get bad smells out of their hair/fur. Overall, you can trust this product. It’s made from a great company who knows what they’re doing, and you can be sure to get some of the best quality for your puppy out of this shampoo. Although the title of this shampoo talks about how it’s made for "dogs," you can believe that a young puppy will also be able to benefit greatly from this product. It’s a very cheap product, with $10 being its original price! The condensed scent inside of this bottle is unbelievable, and is the best smelling puppy shampoo on our list! The main smell that they sell is baby formula smell, which could be pretty entertaining for some of you. You might think that this was a weird choice for the creators of the shampoo, but it’s proven to be quite the success in the world of doggy shampoo. All in all, you can’t go wrong with this shampoo for your dog, if you’re unsure about which one you want to buy, just make a decision and stick with it with this exact product. You won’t be upset about choosing this one. Out of every type of shampoo, I went over, I don’t have an absolute favorite. This guide was meant to inform you about some of the best ones you can buy. One way to avoid spending a lot of money on your dog is to find a way to keep your dog clean. This can be easier said than done, but if you can figure out the best way to keep your dog clean, then you can ultimately end up eliminating the need to wash your dog clean as much as you normally do. The only time you should take your dog outside is when you take you take him/her on a walk, and in those scenarios, you should try your best to avoid wet areas, and try your best to only stay outside for a limited amount of time. Using all of this advice, you can drastically alter the dirtiness of your dog after a period of time. Brushing your dog. Believe it or not, brushing your dog to avoid matting is going to be one the best things you can do to clean up your dog without having to put him/her in the bathtub. Also, when you’re brushing, you’re going to be able to remove a lot of dirt hiding in the fur of your dog. Down the road, you can postpone your dog’s next bath by weeks if you can manage to brush your dog just a little bit every few days! Aside from your dog’s bed, you should clean anything that your dog uses on a day to day basis, such as a disgusting toy that he/she cuddles with to the rug that your dog lays on every day when you’re outside. The point of this is to ensure that your dog won’t go right back to being smelly because that’s probably one of the biggest reasons you gave your dog a bath in the first place. If you’re able to use all of these methods, then you can really postpone the amount of time it’s going to take for you to have to wash your dog again. 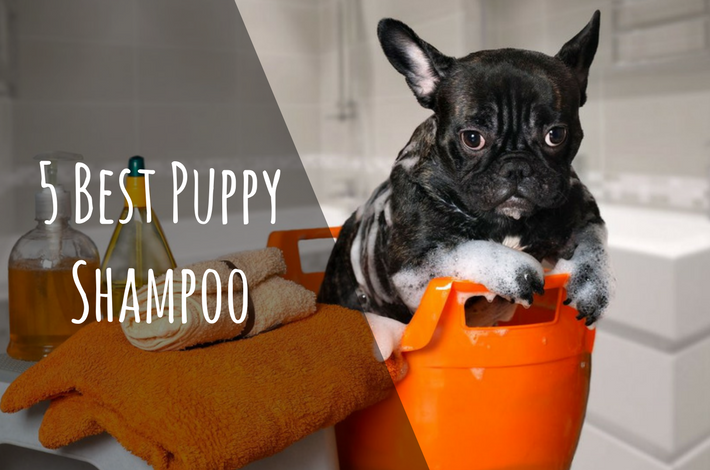 Just using a few of these ideas can save you a lot of money on puppy shampoo over the years. Smell as good as possible. This is a huge deal. Nothing is more satisfying then washing your dog and then being able to smell your dog’s new smell. Buy a dog shampoo that will be good for your dog’s skin. Some of the best products for washing your dog’s fur are going to be able to moisturize your dog’s skin, making them healthier. If you’re unable to find a shampoo that’s good for moisturizing, then go straight for a product which is made from natural ingredients! Overall, I hope that the guide was able to help you in making the right purchase decision for your puppy's bath time!